PH0006741/119 - WESTERN GREYHOUND LTD, WESTERN HOUSE, ST. AUSTELL STREET, SUMMERCOURT, NEWQUAY, TR8 5DR Cancellation Accepted by SN: Operating between Bitterne Shops and Bursledon Tesco given service number 15 effective from 07-Feb-2015. PH0006741/120 - WESTERN GREYHOUND LTD, WESTERN HOUSE, ST. AUSTELL STREET, SUMMERCOURT, NEWQUAY, TR8 5DR Cancellation Accepted by SN: Operating between Southampton City Centre and Shirley Precinct given service number S2 effective from 07-Feb-2015. PH0006741/121 - WESTERN GREYHOUND LTD, WESTERN HOUSE, ST. AUSTELL STREET, SUMMERCOURT, NEWQUAY, TR8 5DR Cancellation Accepted by SN: Operating between Lords Hill Centre and Hedge End (Sainsubury's Superstore) given service number S1 effective from 07-Feb-2015. With that chapter now out of the way it will be interesting to see how the company develops its current Cornish network. PH0006741/110 - WESTERN GREYHOUND LTD, WESTERN HOUSE, ST. AUSTELL STREET, SUMMERCOURT, NEWQUAY, TR8 5DR Variation Accepted: Operating between Fowey and Mevagissey/ Lost Gardens of Heligan given service number 524/525/526 effective from 29-Mar-2015. To amend Route and Timetable. Other Details: Daily during British summer time only. Operates Good Friday to Sunday after Easter if Easter is prior to BST change. Hourly service. Another Optare Solo from Southampton currently operating in Cornwall in full Velvet livery is YN53ZWE now WGL 812. W401WGH remains bright pink but now has full Western Greyhound names! A couple of buses have joined the fleet from Fal River Buses. S723KNV Dennis Dart / Plaxton Pointer now fleet number 42623 with First in blue and cream livery. Two Dennis Tridents from the same fleet are 33111 PJ02PZP and 33112. ©Ken Baker - with permission. Seen way back in October 2010 in Southampton, buit it still looks the same! PH1011427/1 - SUMMERCOURT TRAVEL LTD T/A TRAVEL CORNWALL, THE OLD COACH GARAGE, ST. AUSTELL STREET, SUMMERCOURT, NEWQUAY, TR8 5DR Cancellation Accepted: Operating between SUMMERCOURT and REDRUTH given service number 402 effective from 16-Mar-2015. PH1011427/16 - SUMMERCOURT TRAVEL LTD T/A TRAVEL CORNWALL, THE OLD COACH GARAGE, ST. AUSTELL STREET, SUMMERCOURT, NEWQUAY, TR8 5DR Cancellation Accepted: Operating between WADEBRIDGE and SUMMERCOURT given service number 413 effective from 16-Mar-2015. 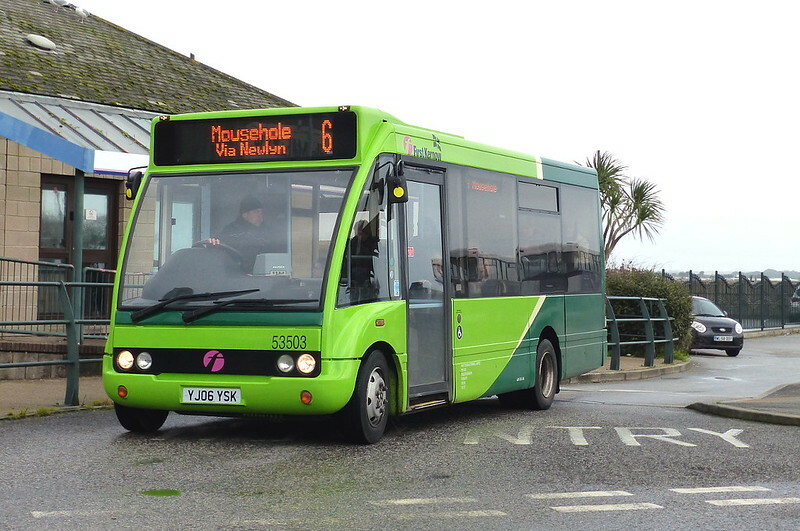 PH1086607/13 - NICHOLAS COLIN EASTWOOD T/A Royal Buses, VICTORY HEIGHTS, THE BURROWS, ST. IVES, TR26 1GD Variation Accepted: Operating between St Ives, Trenwith Car Park and St Ives, Royal Square given service number 2 effective from 16-Mar-2015. To amend Timetable. OK - seems that Flickr is having issues this morning so some photos may not be displaying correctly. Hopefully this will be sorted shorlty! Nice to see the pictures. The 402 looks like housekeeping - was Summercourt - Redruth via Zelah last changed in July 2006. As it is a Cornwall day, WG have obliged with registrations of many timetable changes starting 29 March. Slightly confusing as the route numbers seem to be changing too. There is obviously a new 527 Truro to Bodmin replicating First's 27 and replacing the 520 and 529. The 527 appears to be renumbered 523, but without the Eden section? West of Newquay there are new numbers with 594 finishing at Truro and not Perranporth. Says 550 and not 550/551? Need to see the timetables to get the real implications, but nothing cancelled. Stagecoach also have registrations today for more services to Launceston replacing the WG 510 including Sundays starting 22 Feb. They are relaunching the service as services 6 and 6A in place of First's X9 and X10, which seems to be in the same style as their 1, 4, and 5. It does appear to give some enhancement to Go Cornwall's 576 with positioning and Sunday journeys from Bude to Launceston - will be interesting to see if they connect. However I haven't heard anything for the Launceston to Wadebridge section of the 510. And today WG have registered two more routes to start end of March. Shouldn't they be sorting out the ones they run already before expanding? They cannot run their present commitments. At what point does the Traffic Commissioner (who has been strangely silent until now) say enough is enough and give them a ban on registering new routes, a disc cut, or just revoke the licence? These issues have gone on far too long. DVSA were in there before the sale! Absolutely. Surely the TC shouldn't allow any new services or increases to existing services until all the 'temporarily suspended' journeys have been reinstated? That said, one has to wonder how long they can survive competing against First. First aren't going to reign themselves back in for the time being and they'll be able to hold out much longer than WG. WG have also just sold more of their newest buses - four of the 4yo baby Solos - never a good sign - so presumably still releasing cash to help replace Varios. Nice picture of one of the 11 plate Optare Solos on Ensignbus For Sale page along with Vario number 576 (03 reg) .Must agree with above seems odd to sell off some of the newest & most presentable vehicles.With a seating capacity of 35 this should be a core vehicle to keep for the long term. New registrations doesn't mean more services. 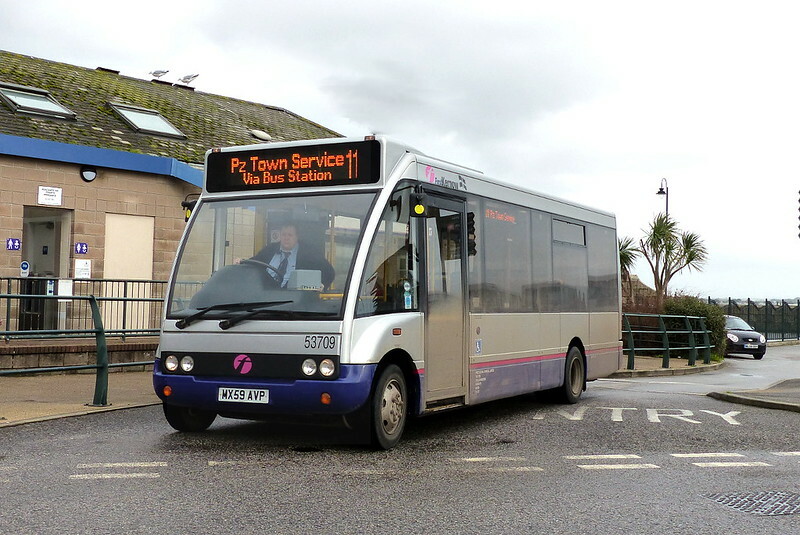 The new 527 Truro - St Austell is the existing 520 currently covered by the 522 registration, but presumably with day time journeys. The 522 is changing as is the 550. This may not need extra vehicles. 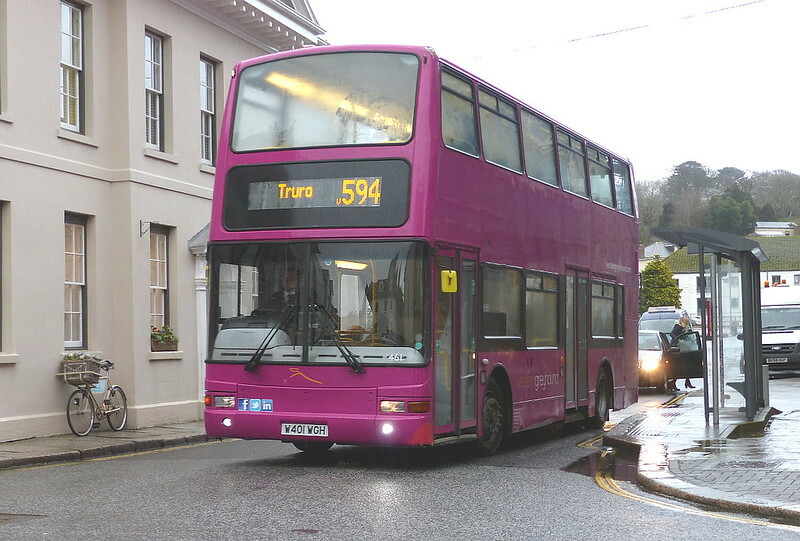 The new 583 may be covered by the 594 not appearing to be registered to Perranporth. As so many timetables are changing the overall requirement may be for fewer buses. We need to see the timetables and know the PVR to answer that. The temporarily suspended journeys could well simply become permanent reductions except perhaps in high season - most companies don't run frequent evening services. The older buses enable chgaper fares.. you can't have both. If First get newer buses than their fares would be as high as Go Ahead! If companies lease vehicles it is normally more expensive than buying the buses and accounting for depreciation. this sounds like cuffy on the first devon panel. citybus are not losing money. and we own the 63 reg buses. Sorry Anon I know that some people have problems with grammar but I am finding it quite difficult to make sense of your posts of the 4th and 5th February. People have such short memory's, first have always run old vehicles (except when they tried the short lived ugobus) and until hi-ahead took over citybus they were always more expensive then citybus, so the new buses higher fares doesn't wash with me, First are the biggest money grabbers out there if it doesn't make a massive profit its cut look at the network now compared to 5 years ago. They run old vehicles because they can get away with it, they are still using stepped deckers which any decent company would have replaced, of course bloggers on here get all teary eyed over the Olympians but the fact is they are not suitable for 2015. Yes - def agree about the Olympians. As mush as I like to see them out and about as an able bodied bus enthusiast, they simply are no longer acceptable on normal mainstream bus services. Passengers quite rightly expect low floor easy access buses these days. It would be interesting to know what is going on with the fleet of buses at Western Greyhound. yet more low floor buses are being disposed of by Ensign, the latest being an 11 reg optare (http://www.ensignbus.com/2011-optare-solo.html) plus ex velvet solos. i would have thought they would have kept those. Certainly on the routes i use i have only seen Merc Beavers. DVSA will no doubt be PG9-ing those Varios then, it's a PG9 if an operator is caught running them now. Lots of PG9s = trip to see Sarah Bell in Bristol and be shouted at lots and probably wave bye bye to your operators licence. No operator licence means no business and no work for people. DDA has been known about for 15 years, so one can argue it's ample time to get your house in order for the change. The laws apply to all. What happened to all the heritage fleet as not heard or seen anything about them for a long time? I believe the heritage fleet was not owned by the limited company, so has remained in Mr Howarth's hands. It is interesting to compare the age profile of the buses of the major operators in Devon's two major cities. 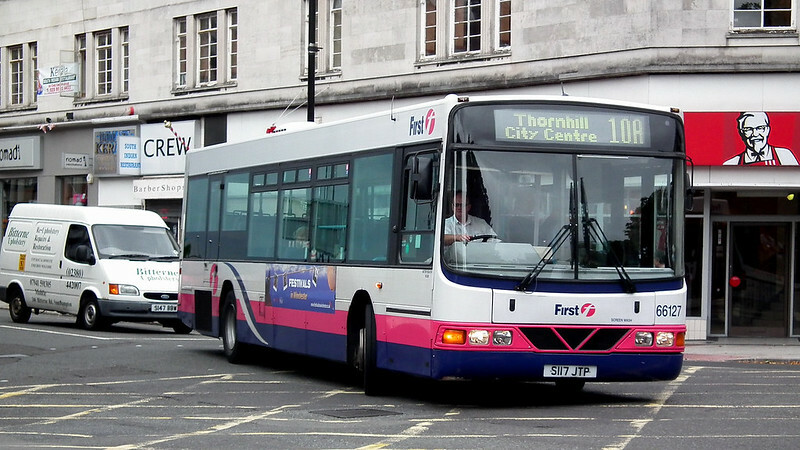 First Plymouth depot: over 80% are over 12 years old, and 60% are over 14 years old, newerst 6 years old. Plymouth Citybus; 50% are over 12 years old, 15% over 14 years old, newest 1 year old. Stahgecoach Exeter depot:All under 12 years old, newest less than 1year old.